Ultimogeniture is an inheritance practice where the right of inheritance belongs to the youngest child (usually limited to the youngest son). It was practiced in some areas of Europe. It is in contrast to primogeniture. That is where the oldest child has the right of inheritance–again usually the oldest son. Records of private businesses are private records. 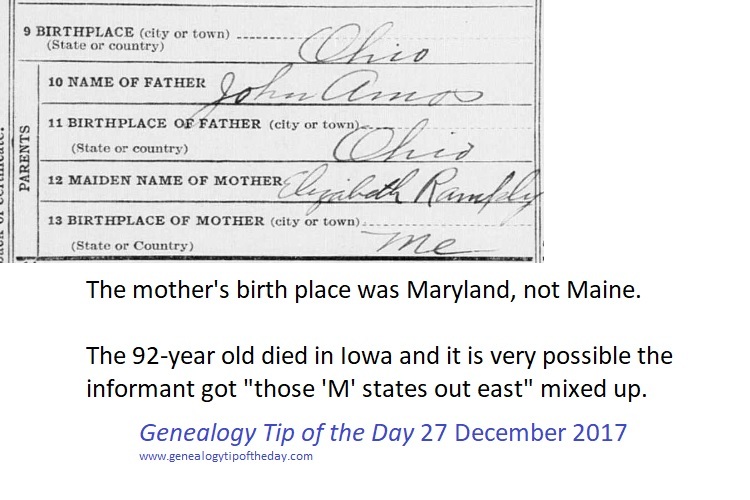 They do not have to be shared with genealogists. 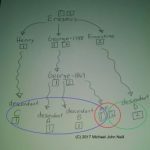 It does not matter how long your ancestor worked for the company, how much money your ancestor spent at the store, or how “bad” you need whatever information they have. Private records are just that: private. Some companies do maintain an archives and are willing to share information with researchers. The records of some defunct companies have been preserved in a public archives. Those are exceptions. You can try and request information from a company for which your ancestor worked. But they are under no obligation to provide you with any information. When Was That Stone Erected? 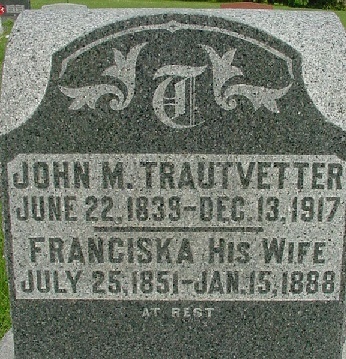 When analyzing information on a tombstone, one thing to consider is when it was likely inscribed compared to when the person died. The longer it had been between the death date and the probable inscription date, the higher the potential for error. Just because it was thirty or forty years from the date of death to the probable inscription date does not mean the date is wrong, just that the potential for error is greater. Abbreviations for place names can change over time. What is used for a location today may not be what was used one hundred years ago. Sometimes old forms fall out of use or governmental or postal regulations change the “standard” abbreviation. Some census takers or other record officials make their own abbreviations when they tire of writing the same location over and over. Self-made abbreviations may be unique to the creator and are best analyzed with local geographic names in mind. And sometimes Indiana was abbreviated as “Ia.” Today that’s the state of Iowa. But if you see it in an 1850 census enumeration for someone living in Indiana,chances are it means Indiana. Probably. Throughout the entire court case he is referred to as Christopher Troutfetter. His name was actually Christian. There are numerous other records on this man where he is referred to as Christian–except this court case. When transcribing these records for my files, I transcribe his name as Christopher because that is what the documents say. I make an annotation that his name is incorrect through the document. That annotation is done separately from my transcription of the document and in a way that does not suggest I am correcting the document one hundred years later. We don’t correct errors in records when transcribing them. When something is clearly incorrect and all “whacked out,” a notation is made so that others know the error was not ours. But we do not correct known errors when making a transcription. That’s not what a transcription is. “Cousin” is one of those words that people sometimes use in a variety of ways. It may mean first cousin (where two individuals have parents that were siblings), it may mean a more distant cousin relationship, it may be a cousin-by-marriage, someone who is related in an unknown way, or someone who may not even be related at all. Genealogists are sometimes precise in their use of cousin relationships. Other people often are not and sometimes genealogists find it easier to use the word “cousin” instead of the precise term for the relationship. Don’t assume the precise nature of the relationship when someone is referred to as a “cousin.” Research it to try and determine what it is. And remember that there’s always the chance that the person’s not actually related at all. Your ancestor may have said on his immigration papers that he was coming to live with his “cousin” when in fact that “cousin” was simply a former neighbor who agreed to help him get settled and saying they were “cousins” made the paperwork flow a little easier. Some of these have been microfilmed and digitized. Others have not. Start with the National Archives website (https://www.archives.gov/) to learn more about these records.